Thank you so much for the well wishes and overwhelming response to my Birthday Giveaway! You guys rock! Just a quick post tonight to show you my celebration manicure to celebrate my 1st blog birthday. Yes I am corny like that and use any excuse to celebrate with a mani OK! I've wanted to do a cupcake manicure for a very long time now but I decided to save it for this blog milestone =D Here is my Cosmetic Cupcake manicure! I wanted some bling so I went with 3 coats of the awesome Rescue Beauty Lounge Frugalista on all fingers except accents. I hauled this beauty in the 50% off sale last year and am now kicking myself for only purchasing 4 polishes. Frugalista is a gorgeous silver and purple glitter and I now know why Rescue Beauty Lounge polishes are so hyped about! The polishes are just gorgeous and it was easy to apply and quick to dry. 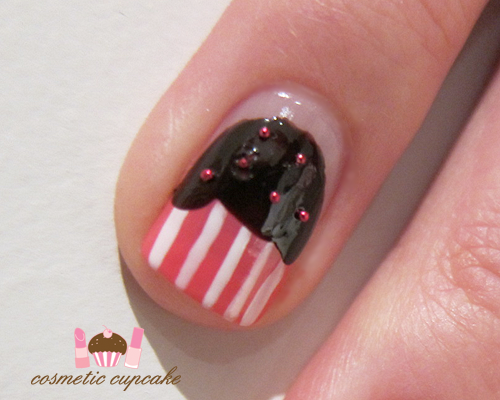 I then freehanded cupcakes on my accent fingers by following Rina's great cupcake tutorial. You might notice that my cupcake is in the same colour scheme as my logo! It by no means looks like the work of art Claude made for me but I tried =p I didn't even attempt the lippie and nail polish bottle as it would have been a fail haha. I am still completely in love with my logo!! For this design I used a coat of Butter London Pink Ribbon as a sheer base. I then used China Glaze Sugar High to freehand a thick French tip and used Kiss nail art striper in white for vertical stripes to complete the cupcake liner. I then drew a large half circle on top of the cupcake liner using Ulta 3 chocolate cake and added dark red bullions to make sprinkles. The pic above is of the design on my right hand (which I hardly show) as I actually preferred the way I did the cupcake. I got lazy with my right hand and didn't add the cherry which I did using China Glaze Empowerment. I topped it all with a coat of Coffret D’or gel mode topcoat which Christina gave me in one of our swaps. The topcoat makes my nails so lovely and shiny! I have yet to fully use it properly though. I'm now trying to think of a mani design for my actual birthday! What would you suggest? awww this is so cute!!! I love that it matches your blog banner! It looks so yummy and gorgeous! !Love glitter nails!! this is so cute and it matches your blog! you should incorporate it into your banner. The cupcake is so cute! I want to eat it LOL! how cute :D it looks great even when you freehanded it! i don't think i could get something half as good if i tried lol. 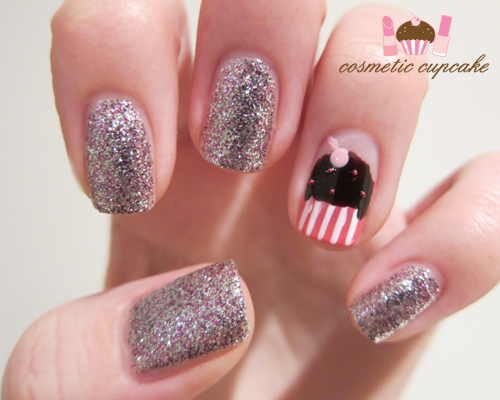 This manicure is beyond cute and absolutely perfect for your blog birthday! 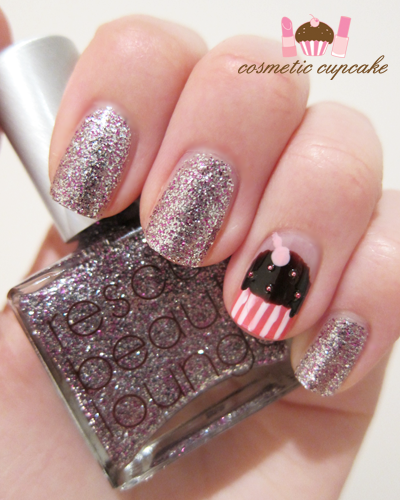 That RBL is stunning and the right amount of bling for a celebratory design, and the cupcakes are adorable. This is soooo cute! I wish I could free hand like you can! lovely cupcake. i'm going to check out your birthday giveaway now. i thought you might be interested in entering my ELF 83-piece makeup palette and nail polish set giveaway too! @Blushingloves Irene Greece: I think I would wear glitter everyday if it weren't so hard to remove xp You can't go wrong with glitter! @Enamel Girl: I'm a bit OCD and like to have things matched lol. That's a really great idea hun! @shiny: I'm so happy you like it hun!! I've wanted to incorporate my logo into my mani for ages and it was definitely fun =) I'm so lucky that my dear friend Christina gifted the top coat to me! It's definitely VERY high quality so I'm using it extremely sparingly. @Tassa: Hehe glad you like it Tassa! @Ellie: Thank you so much Ellie! @Mez: Awwwww you flatter me Mez! You are a sweetheart =) I'm so happy you like it! I've been waiting to do this mani for MONTHS now so it was good to finally see it on my nails! @mandy: It just takes LOADS of practise, patience and a steady hand. More patience actually lol. @Antonia: Thank you Antonia! Sure I can definitely do a Hello Kitty manicure sometime. I've done one previously here: http://cosmeticcupcake.blogspot.com/2010/07/color-club-hello-kitty-manicure.html. @Danielle: Awww you are always making me blush Danielle with your sweet compliments =) What better way to celebrate than with some glitter! @Cheryl: Thanks Cheryl. Hope you enter my giveaway! @Dhini: Thanks Dhini! I love cupcakes and always feel like them lol. @Karo: Thank you Karo!! It makes me so happy to hear you like it!